Mary Roach’s latest bit of brilliance. 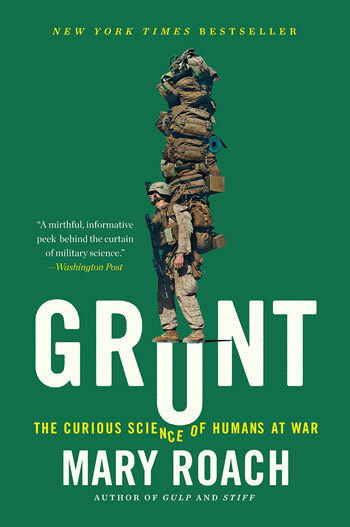 … As meticulously researched, beautifully written, and disturbingly funny as her previous books… Grunt examines the science behind war, as well as the researchers who are leading the charge in these state-of-the-art developments. Roach’s prose is a triumph – an engaging blend of anecdote, research, and reflection. A mirthful, informative peek behind the curtain of military science. A masterful, digestible look at the science of war. … The chapters are rich with information but they never feel weighed down by their density. Roach writes exquisitely about the excruciating. … Wildly informative and vividly written. Roach is a tenacious investigative journalist with an appetite for the unappetizing. … Grunt ranks high in the Roach repertoire. Extremely likable … and quick with a quip … [Roach’s] skill is to draw out the good humor and honesty of both the subjects and practitioners of these white arts among the dark arts of war.